This three piece sectional brings contemporary style and comfortable seating. Featuring a right facing loveseat, corner square and a left facing sofa, this sectional has plump, loose seat and back cushions, providing maximum comfort while relaxing or spending time with family and friends. 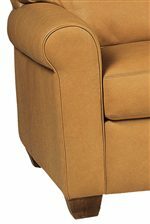 Choose from leather, fabric, or Ultrasuede® and a variety of color options for a custom look that suits your needs. There are many configurations for you to create your own sectional that fits your space. The Savoy Contemporary 3 Piece Sectiona by American Leather at AHFA in the area. Product availability may vary. Contact us for the most current availability on this product. SVY-SO3-LA Left Facing Sofa 1 77" 38"
SVY-LVS-RA Right Facing Loveseat 1 54"
SVY-CNR-SQ Corner Wedge Square 1 37" 37"